Since we drove throughout the night with the car fully charged, we were actually able to leave at 9 am from Wilmington which is a first for us since I've been on the tour. Laura has been doing most of the driving, which she is really good at and Josh is doing most of the filming, navigating and making phone calls. Both are doing awesome. 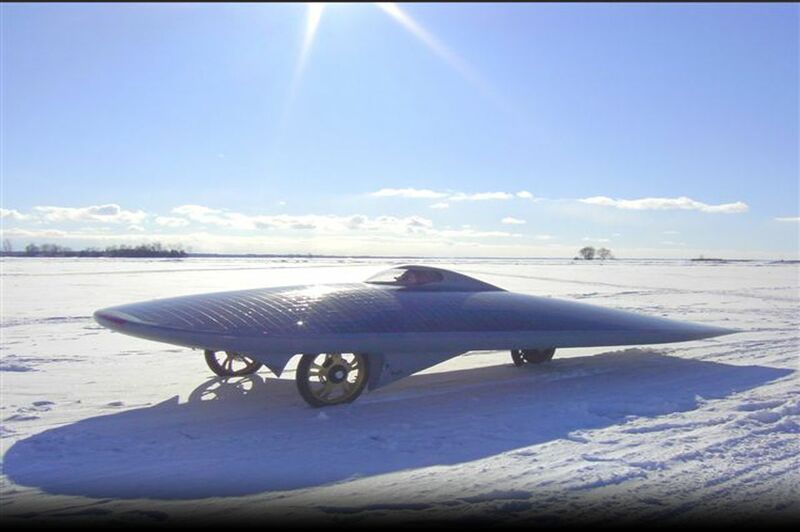 We set a goal to break the solar car's record of driving 290 miles in one day - we wanted to make 300 miles. Unfortunately Marcelo had less than 2 hours of sleep the night before so we had to take a break at a small town called Chocowhitney. It was a nice break though. We stopped at the Food Lion grocery store and Marcelo took a nap under a beautiful old oak tree. The rest of us had a nice picnic under another tree. Josh and I played the Ukulele, then Laura fell asleep with the soft breeze blowing. After packing up, we were off. The batteries could only get us as far as either Virginia Beach or Norfolk, and it was pretty clear that we all wanted to go to the beach. After passing the area filled with hotels and tourists, Marcelo decided to turn down a residential street. We stopped for a minute to figure out what to do when a few people who lived on the lot we parked at came outside to look at the car. It turned out to be a good move to turn down this street because the people let us park in their yard which was right in front of the beach in a very high end neighborhood. Josh and Laura slept on the beach that night. So our total mileage for the day was 274.5 miles which was pretty good.. The team took turns driving and sleeping all last night, and I finally drove us to the Ivy Cottage in Wilmington at the tail end of the 400 mile trek. A man named Donald Lashley, who had ridden his motorcycle to Inuvik, saw us come in. He apparently had been following the project, and knew all about the XOF1. We unloaded the car, and he took some photos of the car, and told us how brave Marcelo was for having already driven his solar car to the arctic circle. After some brief greetings and farewells, we departed northward. North Carolina were truly beautiful, We made it through North Carolina fairly fast, and spent most of the day driving through Virginia. Time really does fly by when we get on the road. It was a good time to do updates, relax, and plan for press and events in D.C. After a bit of route plotting at dusk, we set the route for Virginia Beach. When we pulled in, we drove past several resorts on the Atlantic coastline, and stopped in the closest suburb. Luckily, a house had some spare parking for the van and solar car, and we used it for our lodging. Laura, Jamie and I used the Cavlier (who denied us accomodations) for their washroom. Laura and I, being quite hungry, got some nourishment from a local Harris and Teeter. Over a drink, we discussed the possibility of renewable energy infrastructure, among other things. It was nice to finally have reached a resting point after nearly 280 miles of driving today. We decided to sleep on the beach, using the sun as both our alarm clock and gas pump the next day. I awake from a loud and sudden nasal cacophony. Someone is playing horrid throaty music in their sleep and I have not noticed until now because my sleep is so deep it’s hibernation. The van is stopped and all the solar monkeys are asleep. Josh wakes up and decides to take the wheel and I play navigator until we arrive at around 7am in Wilmington, NC. It is here we unload the trailer with sleep still in our eyes to begin the arduous task of recorded accuracy back to D.C., Yehaw! Today we decide to aim for a record breaking 300 miles in the solar car! used electric devices in the home. A slice of solar powered heaven. Back on the road again Josh and I continue working on our solar car theme songs: “when the sun’s in the sky like a big pizza pie, thatsa solar!” We sing ridiculous renditions of common songs, exchanging the lyrics for solar inspired ones. Thirteen hours after we started driving we reach Virginia Beach and the boardwalk is busy with people. We make quite an addition to the already buzzing nightlife, turning heads and eliciting oohs aahhs and what the #@$% is that’s! The ocean air is a salty pleasure I’m happily familiar with and can’t wait to dive into the deep and refreshing waves, letting the sea consume me. sell us our Guinness after midnight. The cashier suggests a few bars that might still be open and we take to the boardwalk. On the shore, Poseidon stares down from 20 feet above us; his form is emerging from sculpted rocks and waves with an octopus sticking to the side. He holds a turtle in one hand and his trident in the other, pointing to a seafood grill and bar behind us. Best to listen to the ruler of the sea. We enter the bar and have a fresh frothy Guinness, toasting to the solar car and a night out! Making our way back to the parked van we find a big blue cabana umbrella and use it as part of our beach bedding. Josh and I lay out our sleeping bags and bury the cheese in the sand, a treasure to be unearthed in the morning. We talk until the words make no sense and let comfy sand pillows cushion our heads to sail away into sleep. trailered to get up to DC on time. Josh, prepared to work with the head light. Some folks who were interested in the car while we stopped at the Food Lion in Chocowhitney. Driving past a corn field. There were lots of crops along the way. Passing by a pretty field of what looks like lavender. Solar car on the go. Josh running back to the van after filming xof1 crossing a bridge. Statue of Liberty? Nope, statue of sunshine. xof1 going into the sun. vof1 going into the sun.